Doss, Marion. Thomas Paine, Engraving. Digital image. Flickr. Yahoo!, 25 June 2008. Web. 21 Oct. 2015. Thomas Paine is best known as an American revolutionary and one of the most critically acclaimed writers ever published in the western world. Born On January 29, 1737 in Thetford, England, Paine started his journey as an apprentice for his father, a corseter, after failing out of school at the age of twelve. Seven years had passed before Paine decided to take a brief voyage at sea before returning to become a tax officer. Pain didn’t excel as an officer, repeatedly getting removed from his post. However, in his four years at the position, he gathered enough information to write his first popular essay in 1772, The Case of the Officers of Excise, advocating a raise in pay for police officers in England. Newly established as a writer, he met Benjamin Franklin in 1774. Franklin saw potential in Paine and helped him move to Philadelphia. There, in the midst of the revolution, Paine’s career took off. He published his most famous work, Common Sense, in 1776, defending the American cause for independence. In this essay, he addresses the relationship between the colonies and Great Britain as irreparable, England’s motives as selfish and jealous, and independence as something natural; not spiteful. He devises his own system of government based on representation rather than royalty, suggesting the idea of a president instead of a monarch. After serving briefly in the Continental, he returned to Europe in 1791, to pursue inventing. He worked on projects like a smokeless candle and an iron bridge. In 1791-92 he produced an essay called The Rights of Man, which criticized the French Revolution. The anti-monarchist views he expressed in this essay made him an outlaw in England, so he fled to join the National Convention in France. In 1793, Paine couldn’t morally endorse the public execution King Louis XVI. He was placed in jail for posing a threat to post-Revolution France. In his time spent in prison, he wrote his most controversial essay in opposition to the Church, The Age of Reason. His anti-religious views were ultimately the reason his name was essentially redacted from the list of contributors to the Revolution. Reputation tarnished, he died on June 8, 1809 at the age of 72 in New York City. Only a handful of people were said to have attended his funeral. 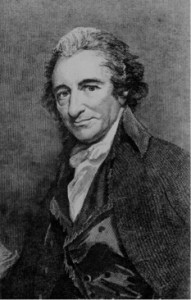 In Common Sense, how does Paine address those who wish to repair America’s relationship with Great Britain? What points does he pose? After reading The Age of Reason, would you say that Paine’s quarrel is with God or people? Both? Explain. “Thomas Paine.” Ushistory.org. Independence Hall Association, 4 July 1995. Web. 21 Oct. 2015. The Open Anthology of Earlier American Literature: A PSU-Based Project by David Walker is licensed under a Creative Commons Attribution 4.0 International License, except where otherwise noted.